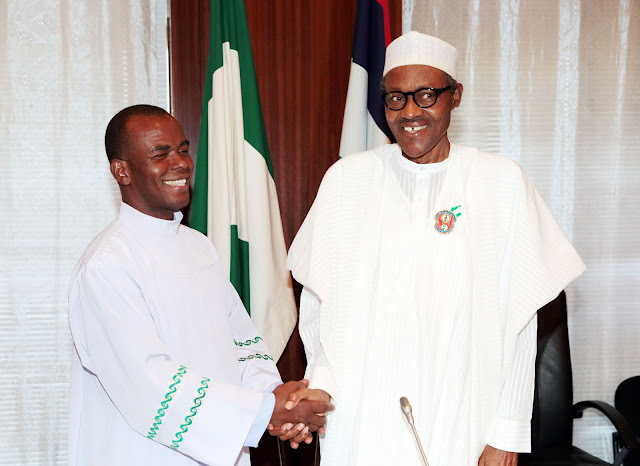 Popular Nigerian Catholic priest, Ejike Mbaka, has said that plans are being hatched to murder President Muhammadu Buhari over his uncompromising stand on corruption. In a video message obtained by NE, Mr. Mbaka urged the devotees at his popular Adoration Ground in Enugu to desist from speaking evil against the president. “So I want to tell you that so far, God is happy with Buhari. And him whom God has blessed, may you not try to accurse, because God will curse you,” said the priest. “Many people are planning, as it is revealed, to kill him. There are many plans on how to eliminate his life so that corruption will continue, so that quantum embezzlement will continue. The exact date of the message could not be ascertained, but it addressed recent occurrences, including the hardship being experienced by Nigerians. The priest attributed the hardship to past leaders who corruptly enriched themselves and their cronies, adding that all of them – from local government chairmen to presidents – ought to be in exile by now. “It doesn’t matter the man of God they worship with, I tell you before God and man, all of them are wicked. They hate this country,” he said. “They succeeded in removing the liver, kidneys, and cardiovascular systems of this country, and paralyzed the neurological organs and handed over to Buhari, the new president, shambles, skeleton almost, a nation that is comatic. “Nigeria right now, economically, security wise, is in the intensive care unit. If the oxygen is removed, Nigeria will go. “The entire money voted for hospitals were looted out. “Corruption was in quantum. To the level that the Nigerian bishops had to compose a prayer – Prayer against Bribery and Corruption, and assured all the Catholics to be praying that prayer every day after the Communion. In the run up to the 2015 presidential election, Mr. Mbaka threw his weight behind Mr. Buhari, urging his teeming followers to cast their votes for him as the solution to the pervading corruption and insecurity in the country. But the priest continued to deliver his pro-Buhari messages culminating in the president felicitating with him last month as he marked 21 years of priesthood. In his recent message, Mr. Mbaka said Mr. Buhari was God’s answer to Nigeria’s corruption problems. “People of God prayed from here and there, God answered our prayers and gave us Muhammadu Buhari,” he said. “And I want to tell you today, God has told us that Buhari is a prayer answered. President Buhari is an answered prayer. Whether you hate him or whether you like him, Buhari is a prayer answered. “The bishops of Nigeria, the Catholics prayed against bribery and corruption and this president came with a magna charter that has to do with war against corruption. “All the prayers we have been doing against corruption, God answered that prayer through a Muslim, who decided not to discriminate. Mr. Mbaka also said that contrary to the criticisms of marginalization usually levelled against President Buhari’s administration, no section of the country is being marginalised. “Our past…not our past leaders, our past looters, you may not understand, looters, embezzlers pissed on the political positions, have eaten the cake of this country and now everybody is suffering it,” he said. “The youths are suffering it. And they want to tell you that we are marginalized. The Yorubas are not marginalized, the Hausas are not marginalized, Efik people are not marginalized, and the Igbo people are not marginalized. “In the present political scenario, Igbo people have the ministerial position for Minister for External Affairs, full portfolio, in the person of Onyeama. Igbo people have the portfolio for Science and Technology, in the person of Ogbonnaya Onu. The priest urged the congregation to reject any claims that the Igbos were being marginalised by the current government, insisting that the present hardship is the product of “intrinsically corrupt past political” activities. “Many of you were intimidated and you will say what they want you to say,” he said. “But that is not the case. It is my job to put your mind right. When anybody want you to say that Igbos are marginalized, don’t believe it. “The Igbos in the north are doing well, and the northern people are not chasing them away. The Igbos in the Yoruba land, go to Idumota, go to Alaba, Ladipo and so on, they are treated with utter hospitality, with innovative kindness. The Yoruba people are not fighting the Igbo people, so why are we evolving a war that does not exist.